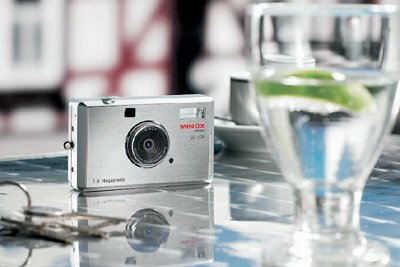 The MINOX DD100 is a true companion for every occasion and comes in a distinguished stainless steel look. But this small, flat camera features more than an excellent design. All the sophisticated controls you need are ready at your command. With a resolution of 3 million pixels and 4x digital zoom, excellent imaging results are guaranteed. Despite ultra compact dimensions of just 94 mm x 56 mm x 26 mm the new MINOX DD100 features a 1.6" TFT colour monitor which allows instant assessment of the image during and after the shot. A fast picture sequence and minimal release time lag capture spontaneous snap shots in every situation. The integrated flash switches on automatically when needed and guarantees perfect illumination, even in critical light conditions. Besides the internal memory, SD cards with up to 128 MB storage capacity can be applied. This offers photographers more flexibility and the opportunity to record a large number of images. Using the USB cable, which comes with the camera, the pictures can be transferred to a computer with the greatest of ease and at high speed. The photos can then be edited on the PC using any commercially available image processing software and directly sent on to others. The scope of delivery also includes 2 AAA batteries, ever-ready case, wrist strap, CD-ROM and instruction manual. 100 g / 3.5 oz.